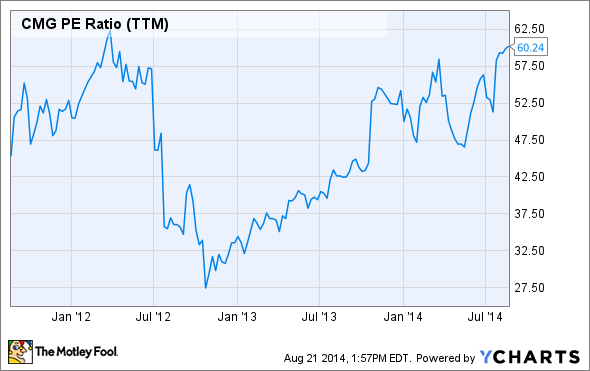 Chipotle Mexican Grill vs. McDonald's: Which Is a Better Buying Opportunity? After Chipotle Mexican Grill's strong rally amid strong growth, and McDonald's year-to-date slump amid stagnant growth, which is the better buy? McDonald's, the king of fast food, is having trouble growing sales, while up-and-coming companies like Chipotle Mexican Grill are moving full speed ahead. Image source: McDonald's. Throughout 2014, Chipotle Mexican Grill (NYSE:CMG) has continued to blow away investors' expectations, while McDonald's (NYSE:MCD) has continued to disappoint. But after Chipotle stock's 69% run higher during the past 12 months, does it still offer more upside than shares of McDonald's, which were flat during the past year? Let's take a closer look at the valuations and future growth potential. On a valuation basis, these two stocks are almost as far apart as possible, at least in this sector. The average trailing P/E ratio for the industry is 27.8, far lower than Chipotle's current P/E ratio of 60, and higher than McDonald's P/E ratio of just 17.1. 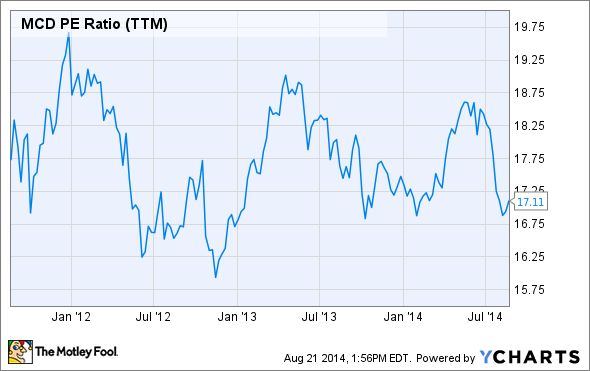 As you can see from the chart above, Chipotle is nearing a P/E ratio of 60 times last year's earnings. If the previous decline in valuation in July of 2012 tells us anything from above, it's that investors have historically found this P/E ratio to be too rich in valuation in order to justify the current price. Conversely, investors have historically found McDonald's to be attractive near its current levels, based on its previous year's worth of earnings. McDonald's signature Big Mac burger. Source: McDonald's. Chipotle's price-to-sales ratio, or P/S, and forward P/E ratio of 5.8 and 39, respectively, are also much higher than McDonald's P/S ratio and forward P/E ratio of 3.25 and 15.5, respectively. Overall, though, Chipotle does have the lower five-year PEG ratio of 2.1, compared to McDonald's PEG ratio of 2.7. It's also worth mentioning that Chipotle's P/E ratio, P/S ratio, price-to-book ratio, and price-to-cash flow ratio are all significantly higher than its historic five-year average, which can be found here. McDonald's, on the other hand, is either in line with, or slightly below, its five-year average in the same categories, which can be found here. It makes sense that McDonald's is a cheaper stock than Chipotle; but cheaper doesn't always mean better. It's got to be cheap for a reason, right? Source: Author's chart, data from income statement. As you can see, Chipotle has been growing revenues and earnings much faster, and that is continuing in 2014. Through the first half of the year, the fast-casual diner has grown year-over-year revenues and earnings by 29.6% and 16.5%, respectively. Furthermore, in the first and second quarter, Chipotle blew away analyst estimates when it reported same-store sales growth of 13.4% and 17.3%, respectively. Customers didn't stop coming to the restaurant, despite higher prices -- but we knew that wasn't going to happen anyway. Analysts expect Chipotle's growth to remain strong, but cool down in fiscal 2015. Have a look at what analysts foresee for Chipotle and McDonald's in fiscal 2014 and 2015. Source: Estimates from Yahoo! Finance, table by author. As you can see, Chipotle's growth numbers are impressive, but are expected to slow in 2015. It's worth mentioning that 2014 and 2015 EPS estimates for Chipotle have been hiked higher by about 8.25% and 8%, respectively, during the past 60 days. In order to justify the stock moving higher, estimates for 2015 may need to move higher, as well. While McDonald's revenue growth appears to be stagnating, at best, its earnings per share are expected to climb at a respectable rate. Chipotle beef bowl. Source: Chipotle Mexican Grill. What side of the valuation fence do you fall on? As impressive as Chipotle has been -- and it really has been impressive -- the valuation is tough to find attractive. The last time we saw the valuation for Chipotle pressing 60 times earnings was in mid-2012, before the stock fell from $440 to almost $230 in just a few months, a drop of about 45%. I don't know if that will happen this time, but it's certainly not something that will make conservative investors comfortable. McDonald's, on the other hand, is currently sporting a dividend yield of 3.5% and is near the low-end of its valuation range. Chipotle certainly has the ability to produce more upside, but McDonald's is more likely to protect investors' downside, while paying an attractive dividend. Investors who have a big appetite for growth also have to be willing to swallow some risk when buying Chipotle. If they don't like the taste of risk, sticking with McDonald's low valuation and healthy dividend payout will likely make for the happier meal.